I got some FPV equipment for Christmas. 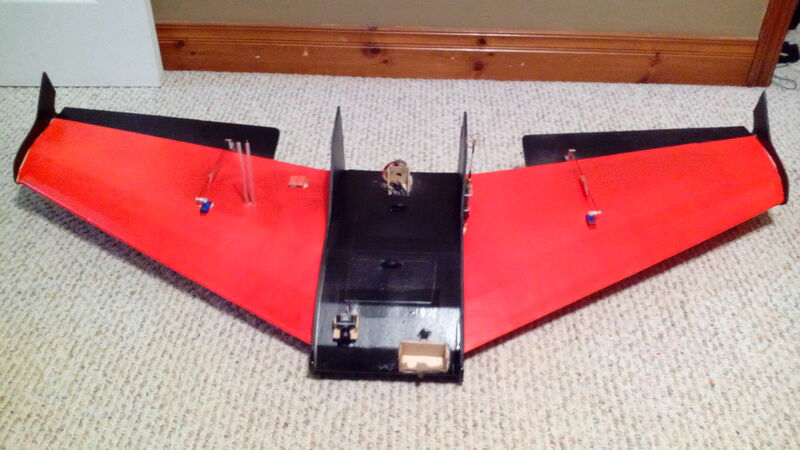 I thought that I would build a Versa wing "bigger" to take the extra weight. I printed the plans out at 120% and added a center pod to take the extra equipment. 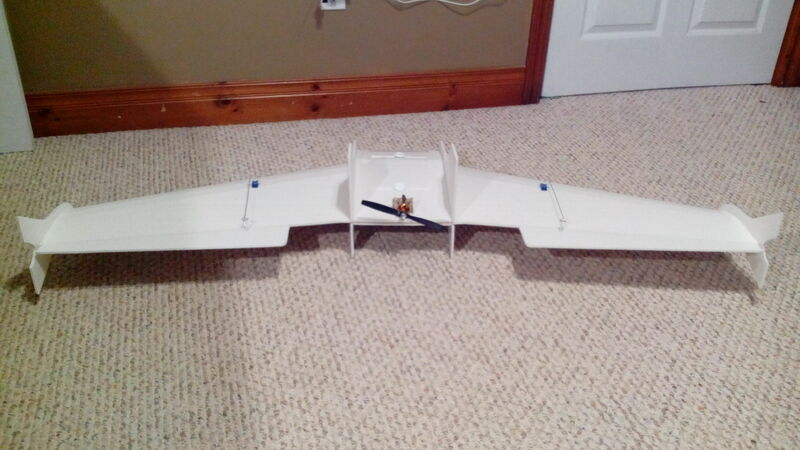 I did the maiden flight today and it worked out quite well. Very cold out today at -15 so it was a quick flight. The trim was way off so it always wanted to go down. I will need to adjust the elevons or possibly the CG. I will play with it a little bit. It turned out to be 54" wing span. 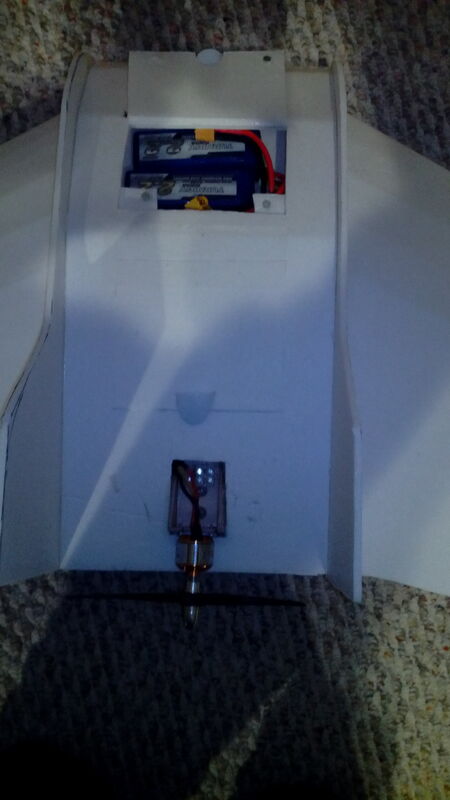 Powered with a RC Timer 2212/6 2200kv motor, 7x3 master airscrew prop, 30 amp Turnigy Plush ESC. Set up for two 3s 2200mah batteries. 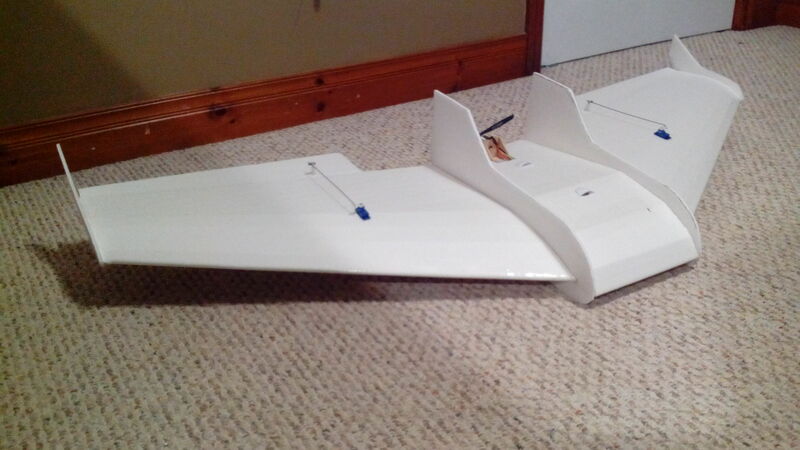 Here is a video of the second flight with GoPro on the wing. 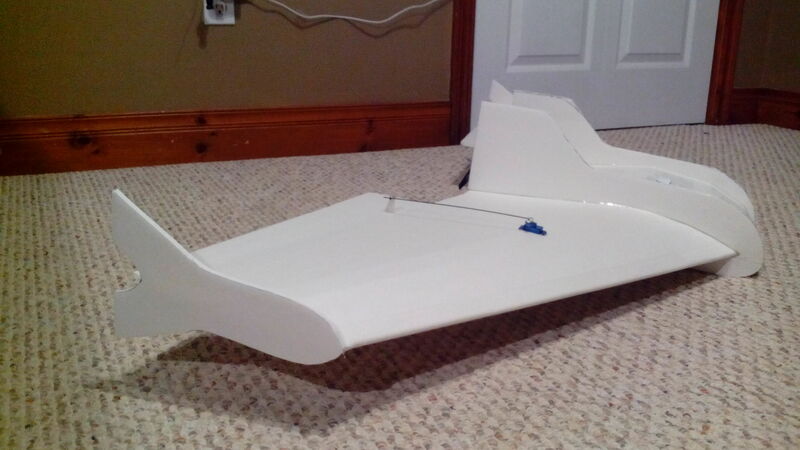 I fixed the CG and the trim and it flew great. I am very pleased with it. Great Job! 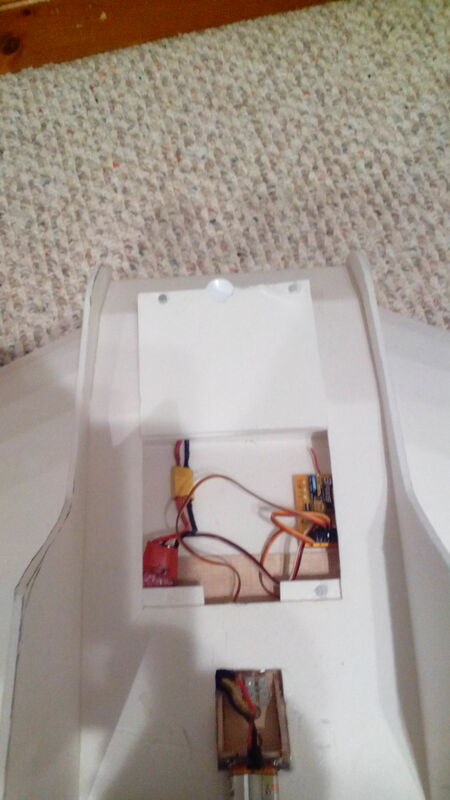 When I build a "Versa" I plan on making it a bit bigger, your +20% scale is just right, I like the pod for the electronics as well! What size prop are you using? you say 7X3, but I see a two blade? Liking the way you made it your own with the extra horizontal stabs. Very clean build! Never ceases to amaze me how versatile these 2212 & 2826 RCTimer motors are, off hand without seeing video I would have suspected a model that large would be a tad bit underpowered but performance is extremely good. Also would have thought the added horizontal stab surface area would have adversely effected roll rate but again I would have been wrong. Was the CG issue truly a CG issue or a reflex issue? Couple mm of up trim on elevens I'm guessing. Well done sir and just curious....what's the AUW? I actually pondered for a couple of days how to do the transition between the flatter wing sections and the larger center section. I woke up in the middle of the night with the idea of the center fins. These serve a couple of purposes. 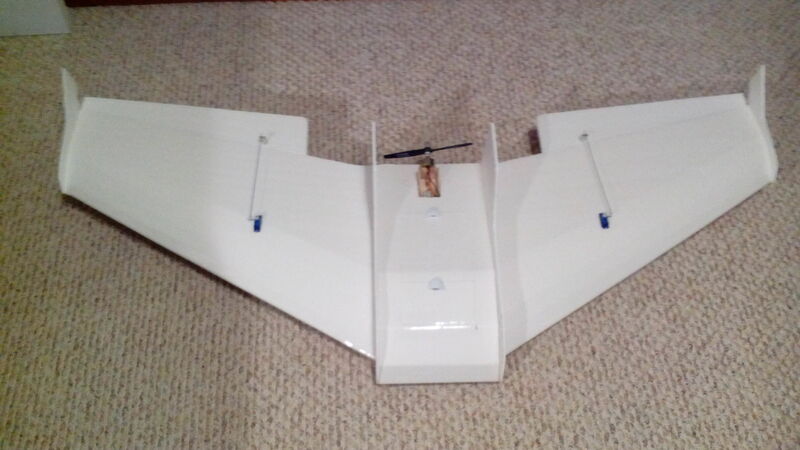 The bottom part of the fins provide clearance between the ground and the prop on landings. (I glued on some wooden stir sticks to the bottom for skids) They also form the transition on the upper side between the two different heights. The CG was a little bit of both. 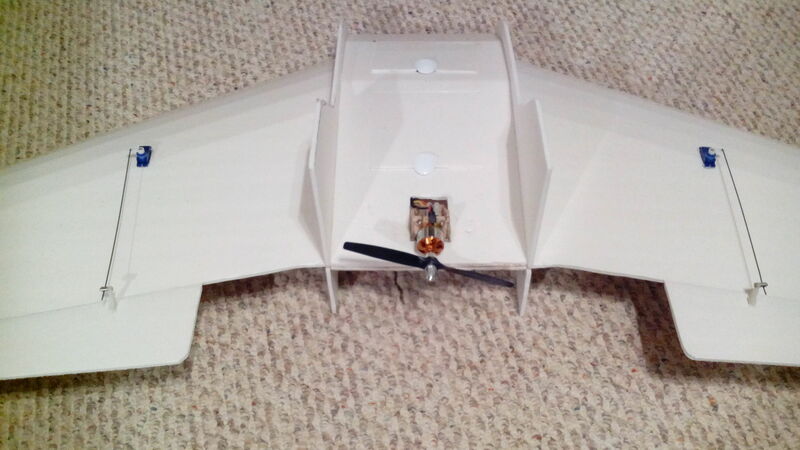 I used the fwcg.3dzone.dk/&#8206; calculator for the CG and according to that it was a little bit light on the front so for the maiden flight I placed the batteries all the way forward plus added an extra 800 mah to balance it out. On the second flight I moved the two 2200mah batteries back a little bit and took out the extra 800mah and put the GoPro on the front. 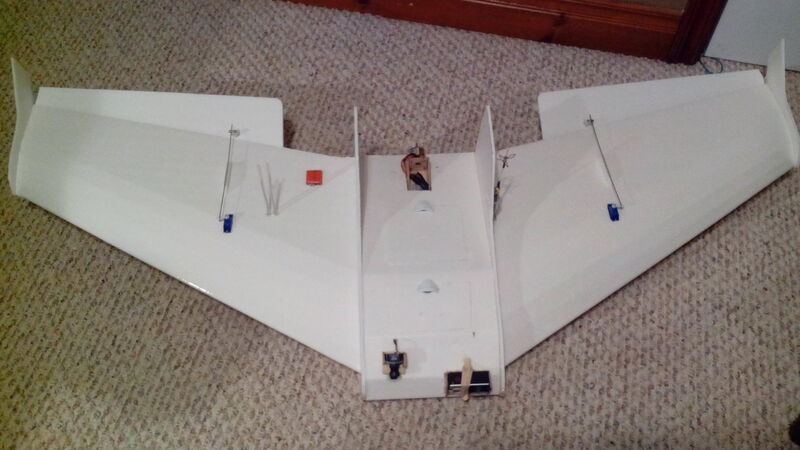 I also adjusted the linkage stoppers to be able to center the trim on the transmitter and have the elevons were I ended up after the maiden flight. Trim was almost perfect on the 2nd flight. I was a little bit worried about the motor as well but I had it kicking around and thought I would give it a try and I was very pleased. 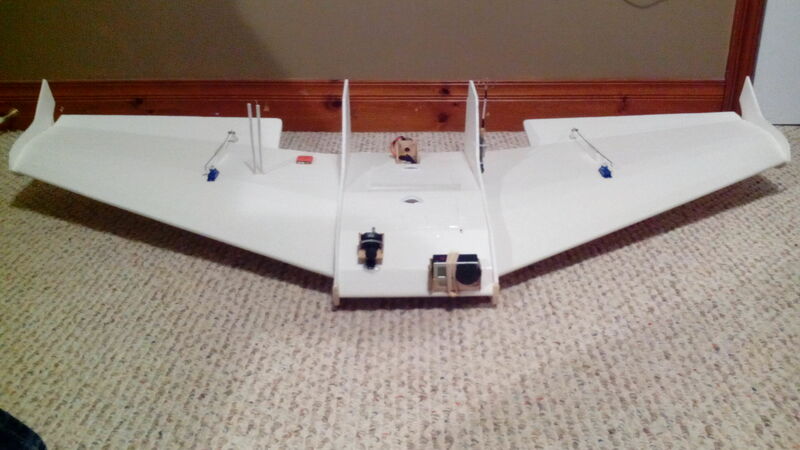 AUW with two 2200 mah batteries and GoPro is about 1150 grams. It will be another 150 grams heaver when I mount the FPV gear and the OSD. 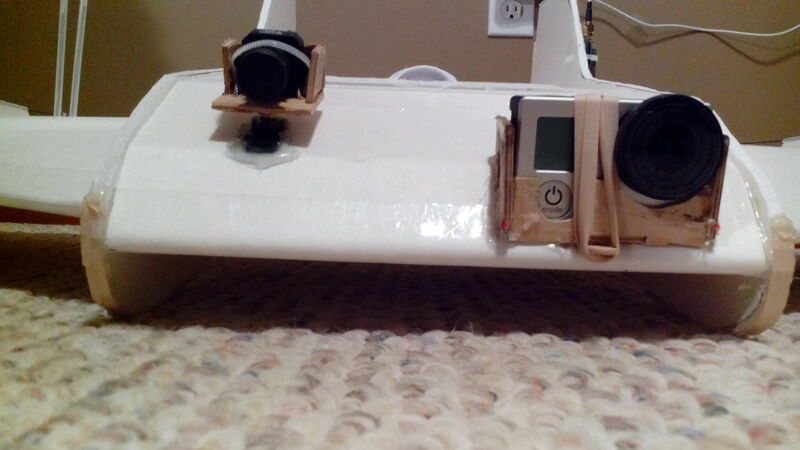 I just finished installing the FPV gear and bench testing. Installed; Orange rx 6 channel receiver with satellite, Cyclops OSD with RTH, Fat shark 250mw video transmitter, Fat shark camera mounted on servo for pan and connected to the rudder channel. I had one problem with the OSD and my orange rx T-six transmitter. 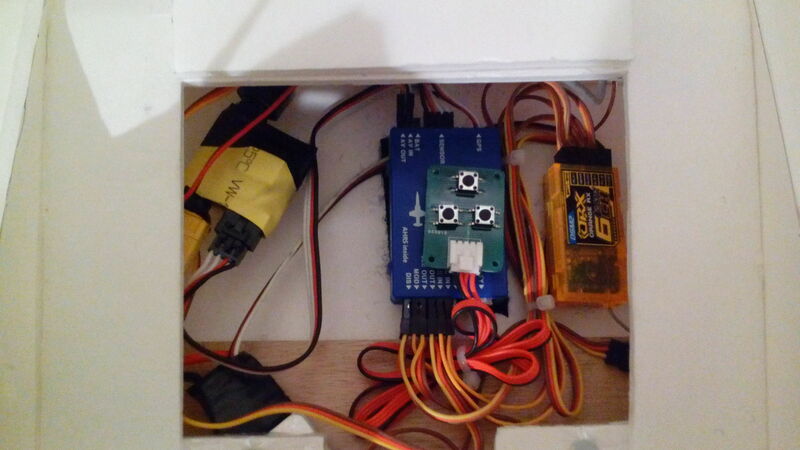 The transmitter does not have a three way switch for connecting to the flight modes. I was only able to get 1. Manual mode and 2. RTH. I can not switch into stabilization mode. Any ideas or should I just purchase a better transmitter? If so any recommendations on a new radio? Maybe something which will give longer range? While here is the final product. I put on some minwax polyurethane and then painted it. I like the big versa very much! Do you think that i can use a standard-versa and just put the middle part in? Yes that would work. Everything will just be a little bit smaller. The Versa is sort for versatile, you can do just about whatever you want. Build it and post the pictures. Tactical EX, Looks like you had fun building the plane. The landing gear add another level to the plane. The fun thing about foam board building is when you bust it up you have just as much fun building another creation. Thanks to Flite Test for giving us ideas which we can use to get us started and beyond. 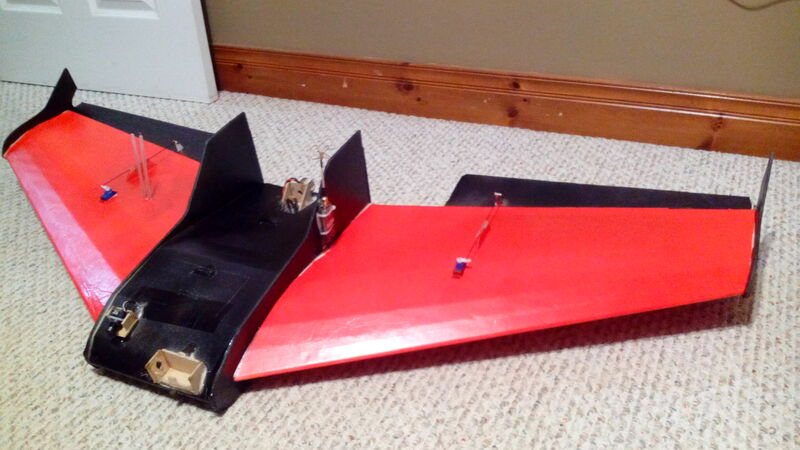 I crashed my wing beyond repair and am about to build a replacement. I got some new radio gear and must have had a malfunction. Should have done a range check. Put it into the ground hard. Oh well off to the DT store for some more. Did adding that center section change the CG much? Where did it end up being on yours? I thought that the CG for mine would be more forward due to the added lift surface but I'm finding that the closer I move towards the original CG point the better it is behaving in the air. It was just about right on.